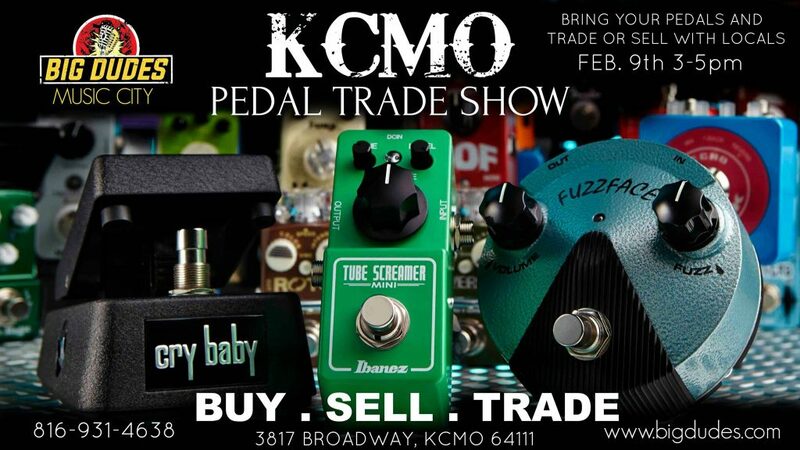 KCMO Pedal Trade show at Big Dudes Music City 3-5 pm! You asked for it Kansas City. 1st Annual K.C.M.O. Pedal Trade Show will be at Big Dudes Music City on Feb. 9th from 3-5pm for FREE. If you have Guitar, Bass or Vocal Effects pedals that you want to Buy, Sell or Trade then this is your day. You will be able to trade freely or sell any of your pedals on this Open market for FREE. Big Dudes Music City welcomes everyone from everywhere to bring your pedals no matter the condition. See everyone at 3pm. ← Rich Redmond Drum Clinic Oct. 27th 2018 3-5pm FREE!